Our current stock of Totally Raw Gallons is this years 2018 fresh crop Totally Raw Honey! This unfiltered unheated honey will bee in it’s liquid state when it arrives, and will then slowly crystallize (or solidify) over time, as it sits on your countertop or pantry. Enjoy! Un-heated, un-filtered honey, with all of the enzymes intact; this honey is a medical marvel as well as a culinary delight. 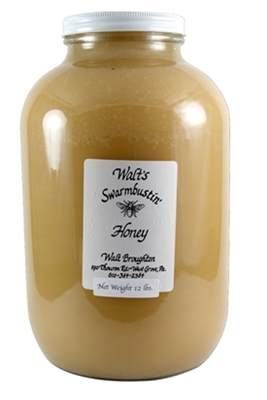 Totally Raw honey is simply spun out of the honeycomb and allowed to crystallize naturally. May be used for all honey needs or as a sugar substitute. One gallon is 12 pounds or 192 ounces. We've been buying Swarmbustin' honey ever since we met Burt at the Brandywine River Museum around 15 years ago. We keep tasting other honeys, but have yet to find one that comes even close to the Totally Raw, which is rich, creamy, healthful, and - most of all - absolutely delectable. We eat at least a gallon every year, mostly on buttered whole wheat bread for breakfast. Yum!